Cody compares student life in the U.S. with what he learned about the Russian system from his experience as a foreign exchange student in Moscow. In the United States students take many things for granted: access to recreation, free internet, strong student support systems, and a host of extra-curricular activities. In Russia universities don’t put so much effort into supplying students with things to do outside the classroom. Student-run organizations are abundant in the U.S., while in Russia they are not so common. Still, they do exist! Here at MSU, for example, I have found my place in KVN (a well established organization, pitting teams against each other to be the most funny in comedy shows). 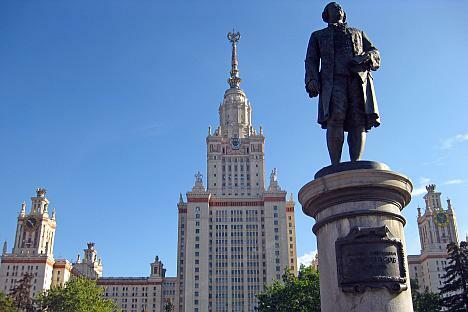 On the other hand, academic facilities such as research labs and libraries are in top shape, which clearly shows where Russian universities put their focus. Perhaps due to the high costs of studying in the States, students have come to demand more services for their money. This is why the quality of life they will be presented with at university is a factor highly valued by American students, almost as much as the institution’s academic reputation. In Russia, because the quality of education plays a larger role in student choices, universities aren’t as pressured to advance certain areas of student life. This lack of student demand for better services also leads to other more subtle differences that caught me slightly off-guard when I first arrived. The rather large and inexpensive meals from U.S. university dining halls are replaced with smaller selections at steep prices at MSU’s “stolovayas” (cafeterias), the dorms, while meeting the students’ basic needs, tend to be small and outdated, and the cumbersome bureaucracy slows down the simplest of processes. Classroom culture of Russian universities is unique as well. Every professor, department and university is different - but Russia has some deep-rooted traditions that differ greatly from those in the States. More so than not, students’ grades are based almost exclusively on the ‘final exam,’ with less attention attached to perceived effort, attendance and homework. The exams require you to have knowledge of the entire curriculum and are quite demanding. The system relies mostly on self learning, and this can pose a challenge for some foreigners - but it’s ideal for most Russians. Student-teacher relations also tend to differ. Don’t be surprised if your professor publicly humiliates you for your poorly written essay! Many concepts considered basic student rights in the States, such as privacy, social equality, and student justice, aren’t well established in Russia and is something that “you just have to get use to,” according to one Russian student. Bribes are known to be a problem in Russian universities, and your personal standing with the professors means a lot, sometimes more than you would think. Considering that finals are usually oral exams, don’t expect your written work to back you up if you get into bad standing with your professor! Despite struggling with some of the aspects of studying at a Russian university, however, I can’t deny that I am enjoying my time here. Life for young people is very attractive, especially in the Russian capital. Moscow can provide students with something to do at any cost and time, and transportation in the city, though congested, is very efficient. I can be downtown Moscow in 30 minutes by metro! In terms of activities, the options are endless. From a walk through the park or riding downtown on rollerblades, to visiting a local exhibition or going out with your friends, fun is to be had! With all of this work and fun strong bonds among students are bound to develop. I’ve met so many great people while studying at MSU, and they have played a critical role in making this experience great. Certain on-campus facilities may be lacking, but everything I’ve needed can be found close by, right outside of the campus (I am lucky to be only 15 minutes away from a large shopping center!). In addition, I’m receiving education at the number one ranked university in Russia, and that’s something no one can complain about! It’s definitely different, it’s Russia, and it can take some time to get use to - but I’m sure you would learn to love it as I have. What about your experiences as a student, both in your country and abroad? Is it similar to the Russian system? The American System? Is student life booming? Or is all about the academics? What about student rights? Feel free to sound off in the comment section below!